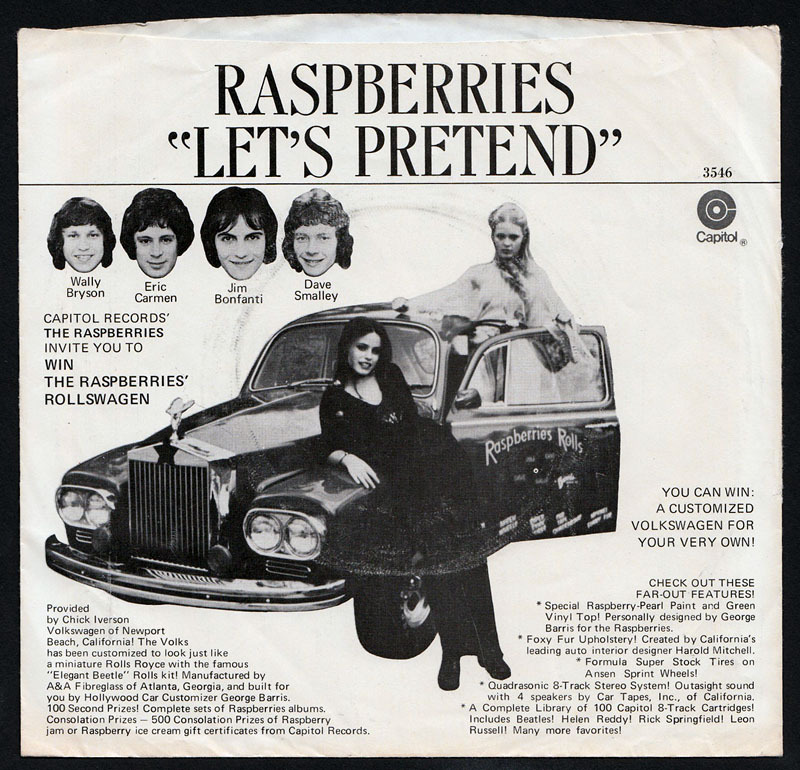 In early 1973, Capitol Records embarked on a Raspberries promotional campaign aimed squarely at the lucrative youth market, girls in particular. 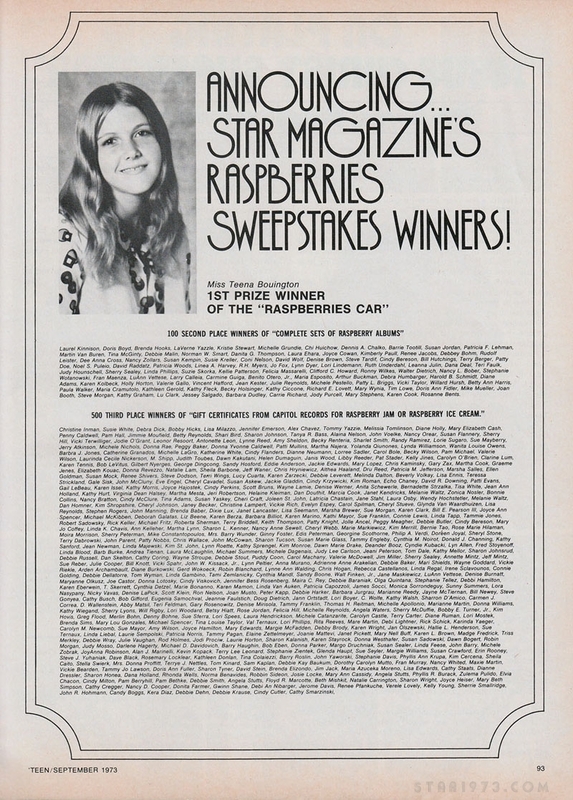 In conjunction with Star, the Raspberries Rollswagen sweepstakes was announced in the magazine's debut issue and was promoted through its fourth issue with entries accepted through the end of May. The Rollswagen was yet another over-the-top Barris Kustom creation, complete with "foxy fur" upholstery and a Quadrasonic 8-track player (natch). One issue later in June 1973, Petersen abruptly ceased publication of Star. A cursory Google search turned up a Billboard announcement that the winner was from Florida and that there'd been 31,000 contest entries. 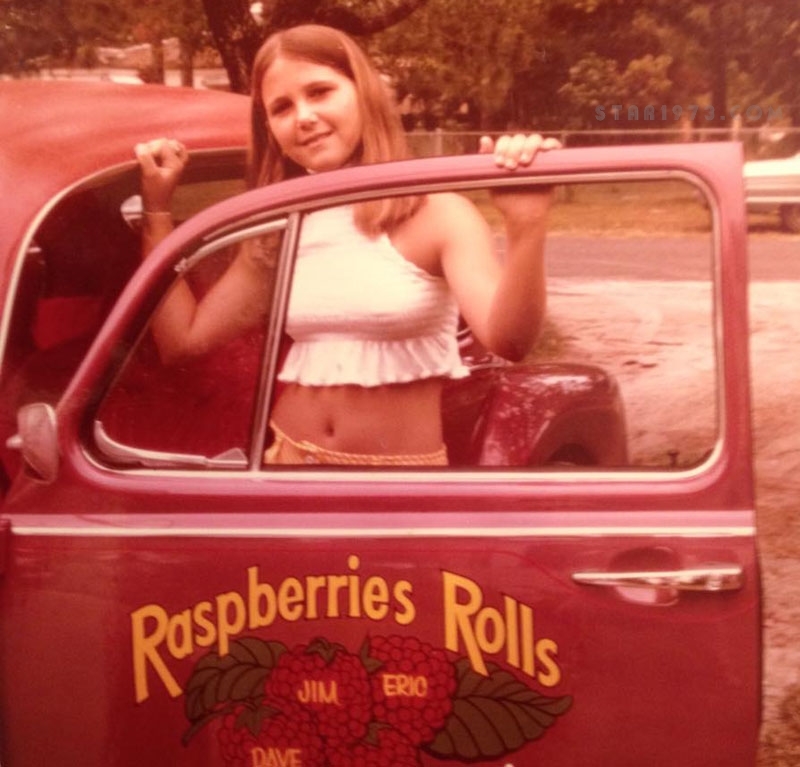 Having logged many years sleuthing for long-lost band members, I felt confident I could find Teena — and maybe the Rollswagen. The uncommon spelling and surname helped narrow the search in a hurry, though experience told me maiden names often go by the wayside. Eventually a search by family name and the tiny Florida hometown led to a newspaper piece where Teena's married name was mentioned. A few minutes later, I jumped onto this era's one-stop-shop for people finding, Facebook, and sent off a message. That evening a reply appeared: "I will give a call tomorrow." For a town with fewer than 4000 residents, Teena's big win was a big deal. There was a parade. 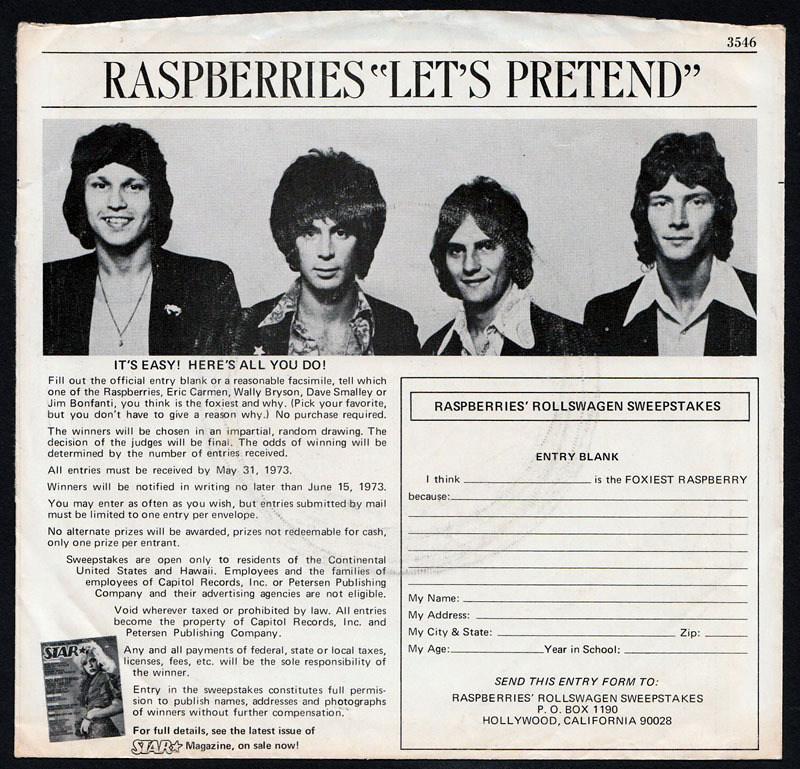 The mayor presented a key to the city to Jim Bonfanti, the Raspberries member Teena deemed "foxiest" and who'd flown in along with Capitol execs for the hand-off. 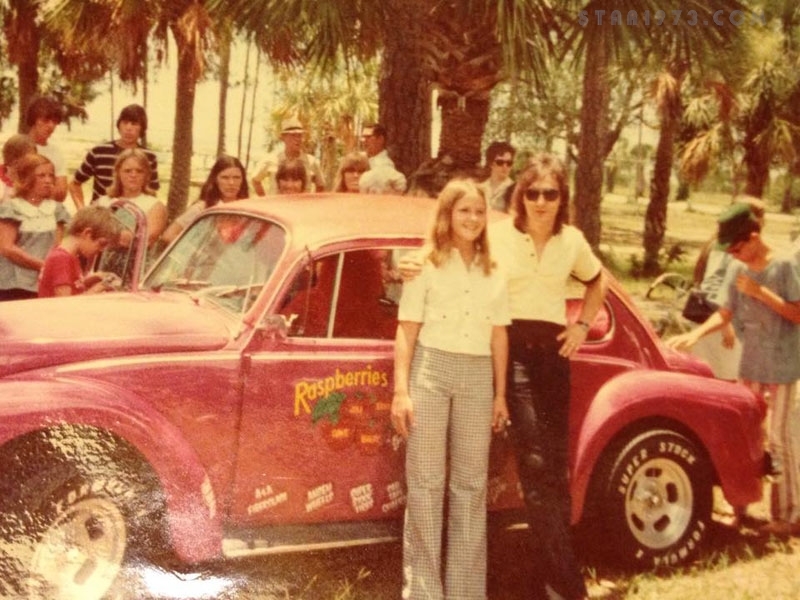 With Teena being three years shy of driving age, the Rollswagen wound up with an older cousin, though she did wind up learning how to drive a stick-shift in it! And so I had to ask: where's the Rollswagen now? Her answer was nothing short of thrilling: "it may still be in my aunt's backyard." With four decades elapsed in the coastal outdoors, the best case scenario would be a rusted-out Rollswagen, a shadow of its former glam glory. Still, I was already imagining a roadtrip to see the thing. After no word from her cousin and a month gone by since we'd first spoken, Teena decided to drive the half hour to her aunt's place. A look around revealed no sign of the mythic vehicle, inevitably vanished in the gulf between way back when and way too late. Her cousin later confirmed the Rollswagen had been junked long ago. Could it have really turned out differently? Probably not. But, hey, a little dreaming never hurt. In fact it's almost required for some things — like morphing a Volkswagen Beetle into a souped-up Rolls Royce or, well, sending off a sweepstakes entry. Just ask those guys who sang Let's Pretend.